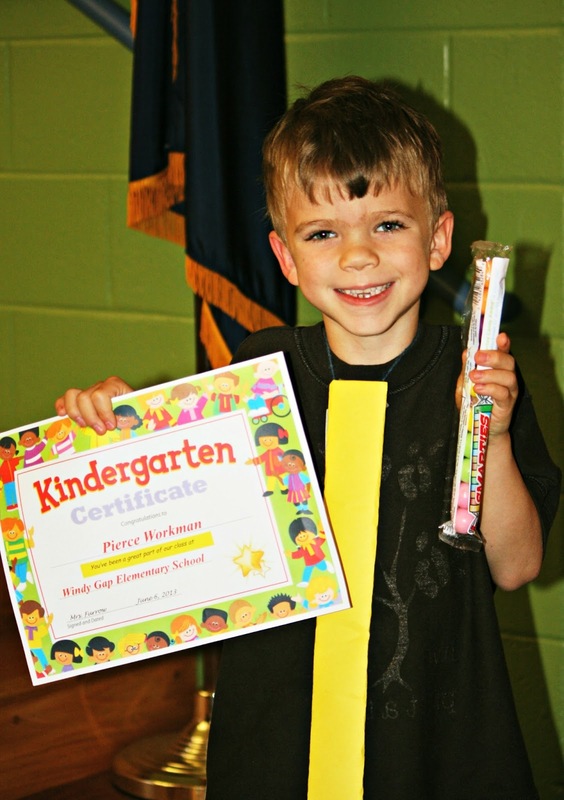 On June 6th, Pierce had his Kindergarten moving on ceremony. It was so cute. They sang a wonderful collection of nursery rhymes set to catchy modern day music. Pierce was the clock from Hickory Dickory Dock. After the program, they gave out candy awards. Each child received an award. Awards included Symphony Bars for the most musical, Mr. GoodBars for the best citizen, Mounds bars for the kid who showed mounds of improvement, and Babe Ruth bars for most athletic. Twenty awards for each class, and each kid received one that was unique to their personality. Pierce's? He got the Smarties award, for the kid who was "always having the smartest ideas and thinking outside the box"
Shucks if I wasn't so proud of him! He worked hard this year, and he did such a great job with his reading and writing. I plan to continue to work with him this summer on his reading and his handwriting (which is kind of scribbly still). We have so much going on that it isn't always easy to squeeze in some schoolwork, but I plan to try for a few minutes each day. Readers, do you have any summer goals? Awww! You should be a proud mama! Great job Pierce! You are a teacher's dream!!! He'll be able to adventure forward in education because you care . . .
What a wonderful ceremony! He sure looks happy in the pictures. It sounds as if you have at least one fabulous, thoughtful teacher in your boys' school! :-) I always get a little teary eyed when children perform. Did you? You must be so proud of your boys. It's nice that you got such great photos of the event for the memory book. Aww- he's such a cutie! the awards show the creativity and care of the teachers, for sure. congrats, mr. smarty! I love the cleverness behind the award that each child received! And Pierce is certainly turning into a find young man, Lisa!! Sorry to say that my goal is just to get through the summer without killing myself! But really, my summer goals are to take Ella fishing and to several water parks, and go to the hot Air Balloon Festival in Lexington on the fourth. I LOVE watching the kids do their programs and take huge amounts of pictures, but yours here are BETTER! I love this whole theme and idea. And whoever came up with the candy thing is a genius. What a great kid! He looks so proud of himself!! Good job, Pierce (and Mom too)! Love those prize ideas! How cute! I love that he won the smarties award :) That's a fun idea! Great job! I love the photos. Congratulations to Pierce! He looks awesome. ooohhhhh Lisa, I so enjoyed this entry!! Pierce is just adorable and what a cute idea to call this special time "moving on"!! I always did small amounts of school work with my boys during the summer, I always made it fun for them and they still both love to read!! Mica's class did candy awards this year to. Having an out of the box thinker is great! I really like that Smarties award! Very cool! What a great concept for those awards!! And you have a clever Smartie - congrats! 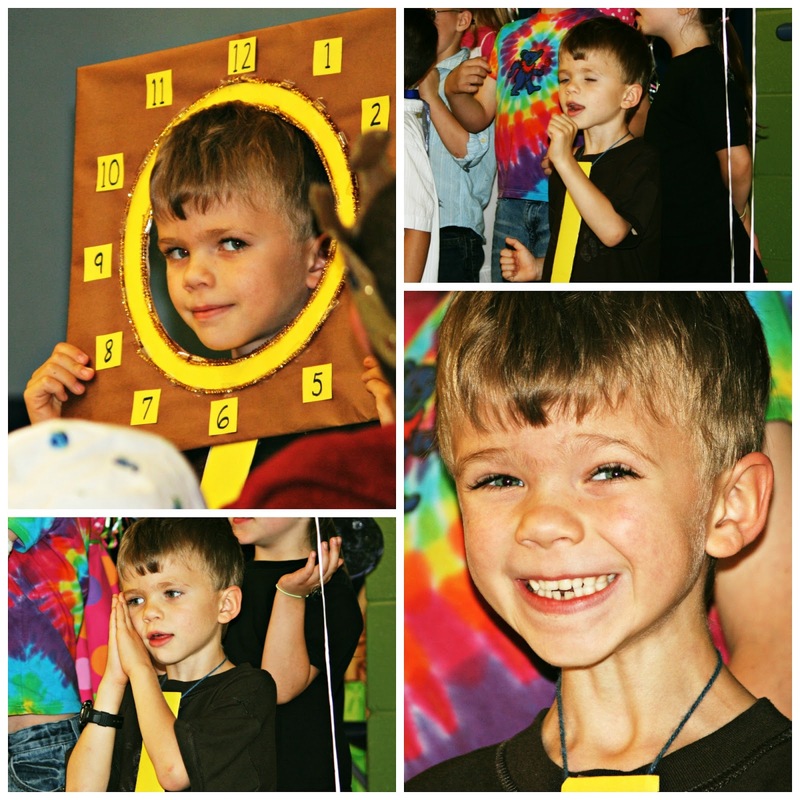 Such a cute, happy, smart little boy! How cute! He is adorable!